Owen James BSc (Hons) Loughborough, Sports & Remedial Massage Therapy MISRM (Level 5), Personal Trainer (Level 3), GP Exercise Referral (Level 3), Indian Head Massage VTCT (Level 3), Exercise to Music, Pilates Matwork (OCR). ALLforYOU was formed by Owen James in 2003. 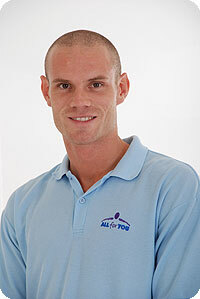 He now has over 18 years sports massage experience and is up to date with his qualification to level 5. 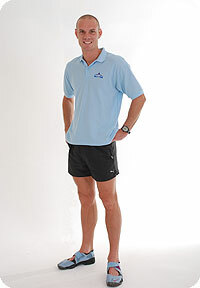 He now has a wide range of clients – people of all ages, people who have never exercised before, serious athletes building up to competitions and corporate workforces. Owen James, founder and owner of ALLforYOU, has been an enthusiastic and active sportsman from an early age. In the English Schools Athletics Multi-events Championships in 1994 he came 20th overall in the country. Owen started his working career as an apprentice, then professional footballer at Sheffield United Football Club. He later graduated with a Sports Science degree from Loughborough University. Owen has been on the management team at Hoar Cross Hall, a top health and fitness spa. He has gone on to train and support personal clients, from complete beginners to professional sports people, helping them to achieve their health and fitness goals. Although he is passionate about sport and fitness himself, Owen recognises that many people do not like physical activity or have ‘fallen by the wayside’ over the years. His ethos is to make people feel comfortable, to help them enjoy their exercise and to recognise the benefits of regular activity. He believes that everyone, whatever their current level of health and fitness, can make significant improvements to their health, well-being and confidence with the support of personal fitness training. Owen recognises the need to keep abreast of the latest thinking and as part of his continuing professional development regularly attends workshops, seminars and courses. Owen currently works with clients in Tickhill, Doncaster and Derby.